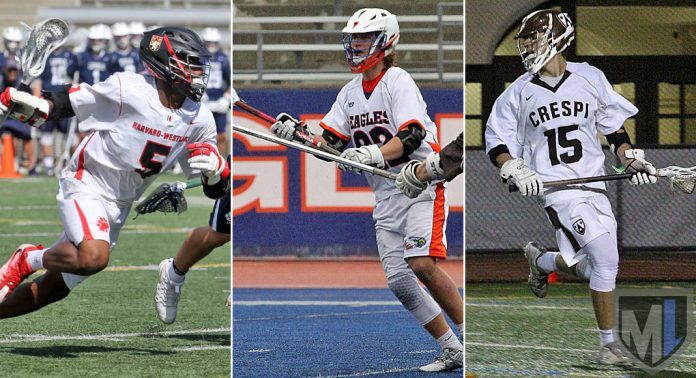 Our look at players to watch includes a group of junior midfielders that are both versatile and — after only two high school seasons — remarkably accomplished. Unfortunately, this year’s list doesn’t include Max Manyak of Oak Park, the Notre Dame commit who scored 33 goals for the Eagles last spring. Manyak injured his knee last summer and will miss the 2018 season. He’ll definitely be a player to watch in 2019. A two-time all-Mission League selection as a defensive midfielder, Daniels this year will be counted to provide a little of everything as a two-way middie. Coach Erik Krum said Daniels is the strongest player on the Wolverines’ roster and maybe in the entire league, and he will use that strength as a downhill dodger on offense, a stopper on defense and at the face-off X. In the fall, he is a running back and linebacker for the Harvard Westlake football team. Like Daniels, Larson also is a versatile two-way middie with a strong, physical presence. He was a team captain for the Eagles as a sophomore and backed it up with 28 goals and 15 assists (43 points) on offense, 97 ground balls and 27 caused turnovers, earning second-team All-Mission league honors. He also spent a lot of time at the face-off X. A wide receiver on the Eagles’ football team, the 5-foot-11, 175-pound Larson was named All-Mission League last fall. After missing much of his freshman season to injury — he appeared in 10 games, scoring nine goals — Soelberg made an impact as a sophomore. He scored 65 points on 53 goals and 12 assists, earning second-team All-Mission League honors and helping the Celts reach the 2017 playoffs after a disappointing 2016 season. A tall, athletic middie with both quickness and power, Soelberg has a hammer of an outside shot and also is adept and working his way inside with slick footwork and stickwork. He is committed to Maryland. Who’d we miss (or whose coach didn’t tip us off about a player worth watching)? Let us know in the comments below. If my son’s head coach at Palisides High won’t mention, jr. Middy, Jack O’Rourke, then I will. He was 2nd in scoring his Fr/Soph yr. right behind Macchio Riccione, Sr. (OhioWeslyan). Jack, #99, 6’2” 200lbs Jr. is due to have another monster season with 4 goals and 3 assists, yesterday in the opening game of the season against Hamilton. Thanks for the heads up, Nancy. We do our best to keep track of everyone, but we need tips from all over to keep from leaving out someone worthy. Looking forward to seeing Jack and Pali at Chaminade on Saturday.